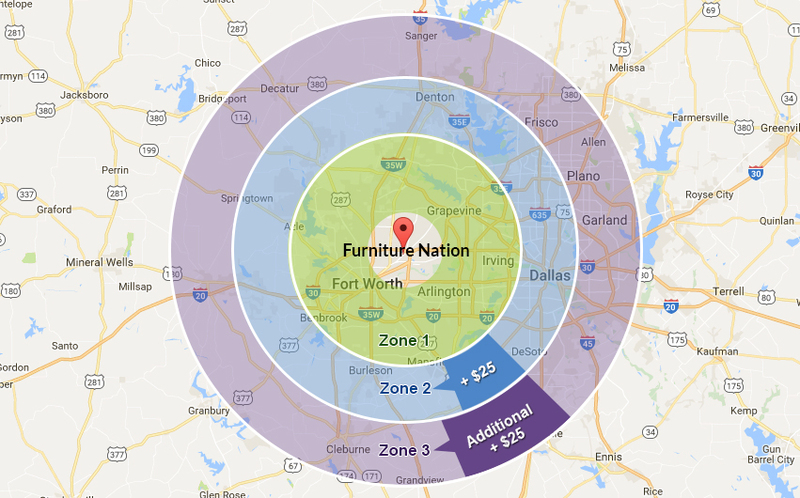 At Dallas and Fort Worth's Furniture Nation, we offer convenient, flexible delivery options that work around your schedule. No reason to take off work or wait around all day! Our delivery professionals are independent contractors who have agreed to schedule deliveries on days, evenings, and weekends to accommodate your calendar-7 days a week. When you choose Furniture Nation, your furniture delivery includes professional assembly and setup services as well. Whether you're in Burleson or Desoto shopping online or in Dallas visiting our showroom, you'll soon discover why so many of our customers are repeat customers-it's called exceptional customer service and we strive to offer you the best. At Furniture Nation, we work with an extensive network of importers and manufacturers throughout North America. (That's why we offer such great values and affordable name brands!) Most orders are available for delivery within 1 week, however delivery times may vary. On occasion, items must be special ordered or demand for a particular piece may be higher than anticipated resulting in a delayed delivery time of 1-6 weeks.